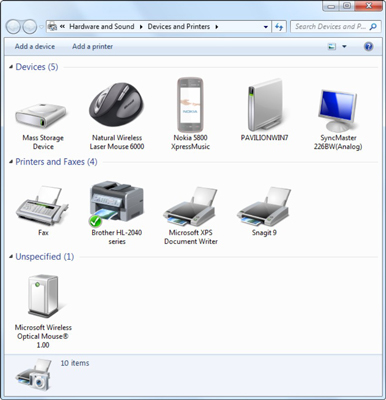 Windows 7’s Device Stage makes the process of installing a local printer incredibly easy. (Most of the time.) Windows 7 does most of the work for you, from recognizing the printer to installing any necessary drivers. In fact, unlike previous versions of Windows, it’s usually better to not install the software that came with your printer. A local printer is just another way of saying a printer that is plugged directly into your PC. It’s the simplest way to install a printer, and it’s the only option if you don’t have a network. When you plug the connector into your PC’s USB port and turn on the printer, Windows 7 is supposed to notice a new device and let you know that it’s installing drivers. When it finishes, you’re done. That simple. You didn’t have to do a thing except plug it in and turn it on. If the printer installs correctly, you should not install the manufacturer’s software, no matter what the instructions in the box with the printer may say. Besides, most printers come with a CD loaded with . . . junk. Note that this is different from the process for previous versions of Windows. When the printer is installed properly, it will appear in the Device Stage’s Device and Printers window. Choose Start→Devices and Printers to take a look. Once in a blue moon, usually because a printer is too new or too old, this streamlined process doesn’t work. Windows might not recognize the printer or might have trouble locating a driver. If that happens, you can use the CD that came with your printer or, better, go to the manufacturer’s Web site (some of the most common are: Brother, Canon, Dell, Epson, HP, Lexmark, Samsung) and download the latest driver. If you have to use an old-fashioned parallel or serial cable (as opposed to a USB or FireWire cable) to connect your printer, you’ll have to manually install the printer. Make sure that you have the manufacturer’s installation instructions handy, and follow its advice religiously.